As I mentioned in my previous post, I was up all night finishing a Klingon costume. I’d been working on it intermittently for a few weeks now but needed to get the bulk of the work done by today. I haven’t posted much here about the il Troubadore Klingon Music Project as it’s still a work in progress, but it’s close enough to our first official event that I feel I can start to blog more about this. We’d been playing Klingon songs since 2009 and began playing conventions with other tunes from popular Sci-Fi franchises (e.g. Star Wars, Dune) and thought “what they hey, let’s do a Klingon Ballet” since we often work with dancers. 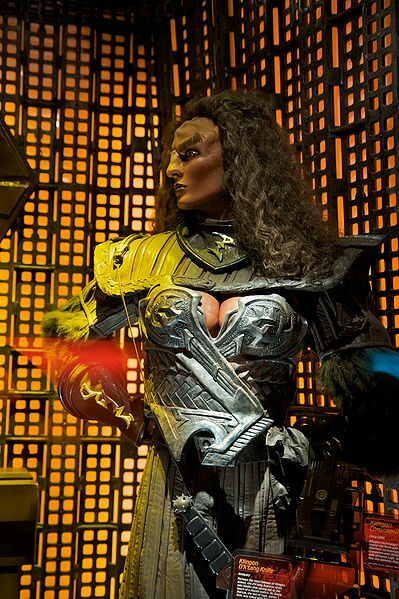 il Troubadore, known on the planet Qo’noS as bomwI’pu’ has been performing tlhIngan QoQ (Klingon music) live since 2009.
il Troubadore’s mission is to record and perform all existing songs in the complete musical oeuvre of the Klingon Empire. Everything from the grand ghe’naQ nIt to the vernacular may’ bom and HIvje’ bom will be able to be heard and appreciated by Terran audiences throughout the planet Earth. So over the past few weeks we’ve all been working on Klingon costumes to go along with the music, and eventually the ballet, wa’SaD ram wa’ ram je, itself. As you can see from the transliterated Klingon title of the ballet now you know why I mentioned the search phrase “sad ram” that brought some poor unsuspecting soul to a blog post about the Klingon Ballet. As it stands, there just aren’t enough fully fleshed out Klingon tunes from the various series and movies, so we’ve been writing and developing our own Klingon music. Here’s a tune I wrote and that we performed at ConNooga in Chattanooga, Tennessee in February of 2009.